Benchmarking – Java, SQL and jOOQ. Some of these bullets were already covered on this blog. For instance avoiding needless, mandatory work, when client code runs queries or parts of queries that aren’t really necessary (e.g. selecting too many columns: “needless”), but the database cannot prove they’re needless, thus: “mandatory” for the database to execute. But as with many other performance related topics, one key message is not to guess, but to measure! Or, in other words, not to optimise prematurely, but to optimise actual problems. 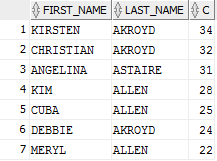 SQL is a 4GL (Fourth-generation programming language) and as such, has always been a cool, convenient way to express data related constraints and queries. But the declarative nature of the language also often meant that programmers are really looking into a crystal ball. A lot of people have blogged about a lot of half-true discoveries that might have been correct in some context and at some point of time (this blog is no exception). Are correlated subqueries slower than their LEFT JOIN equivalents? Are derived tables faster than views or common table expressions? Is COUNT(*) faster than COUNT(1)? To bust a myth, if you have good reasons to think that a differently written, but semantically equivalent query might be faster (on your database), you should measure. Don’t even trust any execution plan, because ultimately, what really counts is the wall clock time in your production system. If you can measure your queries in production, that’s perfect. But often, you cannot – but you don’t always have to. One way to compare two queries with each other is to benchmark them by executing each query hundreds or even thousands of times in a row. Huh, as you can see, in SQL Server, both queries produce the exact same plan (as they should, because the queries are really equivalent). But not all databases recognise this and/or optimise this. At least, that’s what the estimated plans suggest. Also, don’t jump to the conclusion that if the cost of one plan is lower then it’s a better plan than an alternative. Costs can only really be compared when comparing alternative plans for the same query, e.g. in the Oracle example, we had both HASH JOIN and NESTED LOOP JOIN in a single plan, because Oracle 12c may collect runtime statistics and switch plans in flight thanks to the Oracle 12c Adaptive Query Optimization features. As always, disclaimer: Some commercial databases do not allow for publishing benchmark results without prior written consent. As I never ask for permission, but always ask for forgiveness, I do not have consent, and I’m thus not publishing actual benchmark results. I have anonymized the benchmark results by introducing hypothetical, non-comparable units of measurement, so you cannot see that PostgreSQL is totally slower than Oracle and/or SQL Server. And you cannot see that SQL Server’s procedural language is totally uglier than PostgreSQL’s and/or Oracle’s. Ideally, you’ll run benchmarks directly in the database using a procedural language, rather than, e.g. over JDBC to avoid network latency that incurs with JDBC calls, and other non-desired side-effects. Needing to cast INT values to VARCHAR when concatenating them. And again, remember, these aren’t seconds. Really. They’re … Kilowatts. Yeah, let’s settle with kilowatts. Oh my… Wait a second. Now suddenly, the correlated subquery is factor 5… more energy consuming (remember: kilowatts). Who would have thought? This article won’t explain the differences in execution time between the different databases. There are a lot of reasons why a given execution plan will outperform another. There are also a lot of reasons why the same plan (at least what looks like the same plan) really isn’t because a plan is only a description of an algorithm. Each plan operation can still contain other operations that might still be different. by measuring two alternative, equivalent queries, you may just get an idea what might perform better for your system in case you do have a slow query somewhere. Perhaps this helps. And now that you’re all hot on the subject, go book our 2 day SQL training, where we have tons of other interesting, myth busting content!